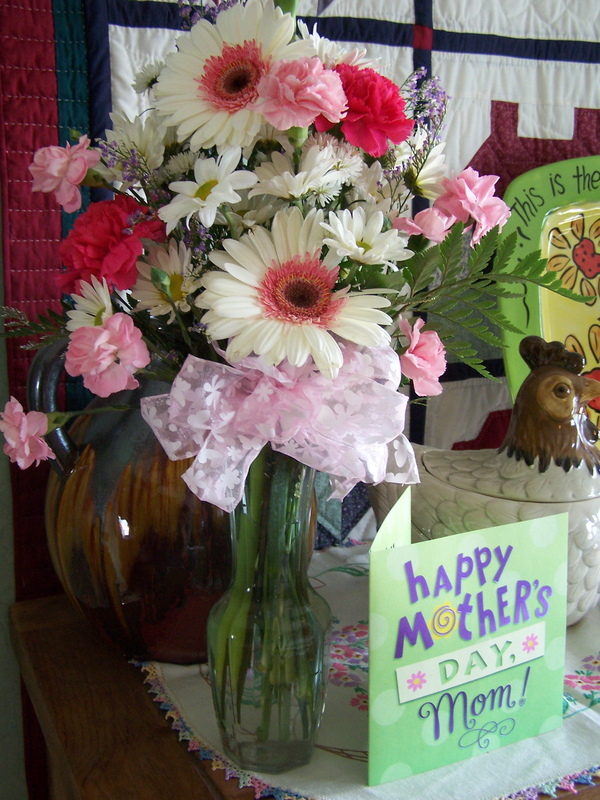 Sunday evening, my youngest stepdaughter called to wish me happy Mother’s Day. That was a very nice and most welcome surprise. Monday, a card arrived from my oldest stepdaughter and her family. This card sings Tina Turner’s “You’re Simply the Best”. That brought a smile to my heart. And today, DS surprised me with some flowers, which I would have thought had something to do with him getting in trouble over his grades this week, (one of the downs of the week) except he had it planned before that happened, and my husband could vouch for that. Another up, was that I finished the commissioned quilt I’ve been working on, and my customers were very happy. No pics, it’s a graduation surprise for the recipient. Another downer is that I have to make another trip for that criminal trial, and it’s next week. It’s bad timing, as I already had a full load on my plate next week, but I’m also ready to get it over with. So, added to the other stuff I had going on next week, means that I will be on the road, traveling somewhere, everyday next week, except for Tuesday. I’m ready for it to be next Saturday already. Then it will be in my rearview mirror. I saw my massage therapist today. She usually doesn’t work on Saturday, but she had to rearrange her schedule this week. She is wonderful, and I really feel better after a session. The NASCAR Allstar race is now on, and already two cautions. Guess I’ll close this up and go watch! What wonderful gifts you received – both pretty and practical! Take great care this upcoming week and conserve those spoons. Maybe you could plan some extra rest on Tuesday. What nice “ups”!!! You must be doing an awful lot right! Saying a prayer for you for the upcoming week. Hopefully it will be a distant memory by next weekend and that the guy shows up so it’s your last trip!!! Pretty thread! Any good shops you can reward yourself with on the way?! The thread is lovely and Storm at Sea is a great pattern. I think it was on the cover of American Patchwork and Quilting’s first issue in dark and medium blues…loved it and have always wanted to make one. The Mother’s Day flowers, phone calls, gifts and sentiments show that you are a pretty special lady (we knew that already 🙂 ). You guys have a different day for Mother’s Day than us. Ours was way back in February. One glorious year, I had the English one and then we were in the States for yours as well! yummy threads! glad you received some tangible evidence that you are appreciated like you should be. yea you! Glad you had a nice Mother’s Day. And those threads are so pretty! I did quite a bit of damage in the Superior booth this week! Missed you! Love your gifts Randi. Can’t wait to see what you do with your Storm at Sea. Looks like you had a great Mother’s Day. I will add you to my prayers to keep you safe next week. I’m glad you had a lovely Mother’s Day, Randi! 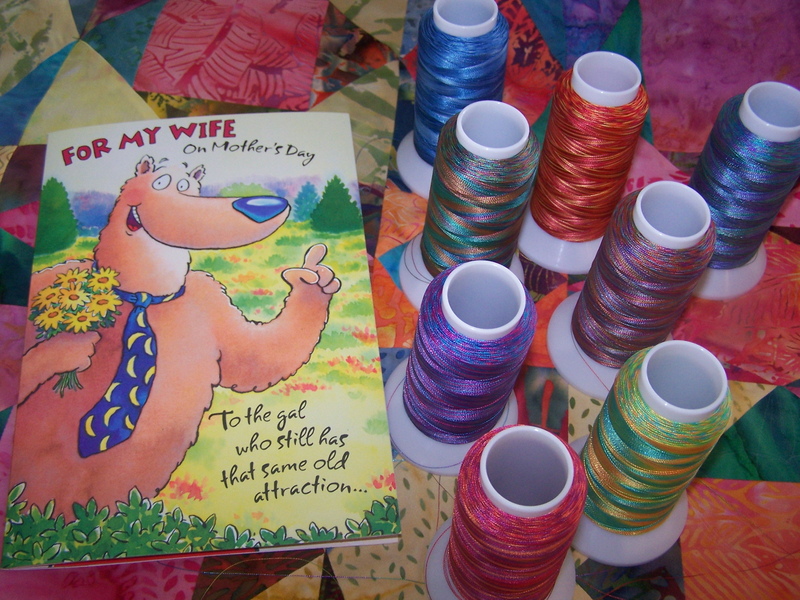 I got a giggle out of reading that your husband gave you a card that whistled. 😉 Love those beautiful gerber daisies in your boquet!